The northern Italian coastal region of Liguria is one of the most beautiful coastlines in Europe and a popular travel destination for gourmets and active visitors. A narrow strip of land that has everything: the sea and the mountains, gently shaped bays and high cliffs, lively harbor towns, quiet villages and very fine cuisine; and just the right climate for the most beautiful vegetation, that arouses envy in the rest of Italy. You will travel on your own and learn more about this area, its history, culture and culinary highlights in just a few days; always following your own pace along the selected route. beautiful sandy beaches. Hans Christian Andersen gave the “Baia delle Favole” (fairytale bay) its name. The heart of the town is Piazza Matteotti and the Duomo. Behind the cathedral, a footpath leads to the Romanesque parish church of San Nicolò all’Isola built in 1151. At the highest point of the peninsula you will find Torretta Marconi, the tower from which the physicist Guglielmo Marconi carried out his first short-wave experiments. In the evening, we have planned a delicious dinner in a characteristic restaurant for you, with a 3-course menu and typical specialties of the region. If you arrive early enough, you can start this culinary experience with a hands-on cooking lesson and get to know some of the best Ligurian recipes under expert guidance. You enter the kitchen of a small restaurant in Sestri Levante and prepare three different dishes in the traditional way. Surrounded by scents and colors, you will have a lot of fun during the cooking class and then enjoy the home-cooked dinner even more. This morning your tour starts in Camogli, situated in the “Gulf of Paradise” and a real jewel which will enchant you with its charming houses all lined up on the hill and overlooking the sea. The heart of this little town is the picturesque marina where colorful boats lie in the crystal-clear water. Your first stop is planned in Camogli’s top bakery to taste the acclaimed „Focaccia di Recco“. Its special features are the thin dough without yeast and the creamy, melting cheese inside the crispy dough layers. It is best right out of the oven. You will be served a real Italian „Chinotto“ with it – a type of bubbly soft drink produced from the juice of the fruit of the myrtle-leaved orange tree (Citrus myrtifolia). Afterwards you must eat one of the many types of „Camogliesi“ – a local chocolate praline which melts in one’s mouth. been transformed in elegant boutiques and bars. After a hike up to the church of San Giorgio and the Brown Castle – built around the year 1000 and used as a defensive fortress in Napoleonic times – you will board the ferry boat again and arrive in Santa Margherita Ligure. A stroll through the streets of the old town leads you up to the Basilica of Santa Margherita d’Antiochia with important paintings from the Ligurian Baroque period. From here you can enjoy the magnificent panoramic view over Rapallo and the Gulf of Tigullio, the elegant yachts and sailboats, the hotel palaces and the beach promenade. In the center of this town you should drop in “Seghezzo Delicatessen” – a popular gourmand shop with regional and national delicacies as well as home-made creations. At the end of the day you will enjoy a wine tasting of three Ligurian wines in an Enoteca. Did you know that the blue jeans were invented in Genoa and not by Californian gold-diggers as generally assumed? The origin of the “blue pants” can be found in Genoa, where already in 1567, the sturdy fabric was worn by the dockworkers. But this city is not merely a shopping destination. Genoa has been “European Capital of Culture” in 2004 and from that year on, more and more visitors come to explore this city. In the Middle Ages Genoa was one of the four Italian maritime republics and one of the most powerful commercial cities in Italy. In the last 20 years, Genoa has undergone a profound transformation which can be seen best at the ancient port “Porto Antico”. Once the commercial center, it is now a tourist port for numerous boats and a meeting point for all kinds of events. It has become one of the city’s main attractions featuring one of the largest aquariums in Europe and other museums. Speaking in terms of food, you might want to shop at “Eataly” which offers more than 6000 first-class products in a 2000 square meter store. Genoa awaits you to discover its sights and monuments, to go on a shopping stroll and of course to taste the local treats. Genoa takes great pride in its local cuisine with fresh flavors and traditional recipes passed down through the generations. Therefore, you will take part in a guided culinary walking tour and explore Genoa’s culture and lifestyle through its food. Along with other “foodies” and a local guide, you will explore the historic center of town and stop at several tasting stations where local street food can be sampled: pastries, focaccia, fried calamari, “frisceu” (vegetable omelet), “farinata” (chickpea-flour pizza) and much more. The Cinque Terre are UNESCO world heritage and a cultural landscape of great scenic and cultural value. The layout and disposition of the small towns and the shaping of the surrounding landscape, overcoming the disadvantages of a steep, uneven terrain, encapsulate the continuous history of human settlement in this region over the past millennium. The Cinque Terre (“the Five Lands”) are the five villages: Riomaggiore, Manarola, Corniglia, Vernazza and Monterosso al Mare. Five little jewels between sea, rocks and vineyards. The first stop this morning will be Levanto, the northern gateway to the Cinque Terre. During the morning, you will learn how to prepare the legendary pesto sauce, starting to know all about the basil harvest and the assembling of the necessary ingredients. You will learn the insider tricks of how to make the true pesto sauce, using mortar and pestle just like the Italians do. The results can be tasted right after the small cooking lesson together with a glass of wine. 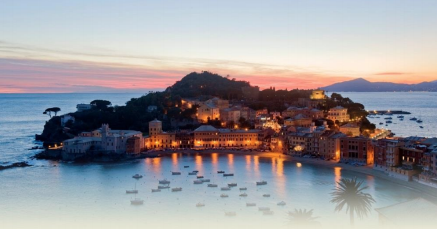 Then, you travel on and in only five minutes by train you will reach Monterosso, the largest of the five lands and famous for its wine and anchovies. In a local Enoteca in the ancient town, you can taste the wines made exclusively in Monterosso, the traditional white wine of this area and the precious sweet wine Sciacchetrà. You also acquire information about and taste another local tradition: the famous Monterosso Anchovies. the most romantic one of the five lands, ideal for picture and coffee time. Starting from Sestri Levante you can easily reach the Cinque Terre by train. We advise against taking the car, because the roads are very windy and narrow and there is no parking anywhere. The package price therefore includes all necessary train rides for this day. • Cinque Terre train day pass, including unlimited train rides with local trains between Levanto and La Spezia, entrance fee to the National Park and its trails. The card includes further services of the National Park, such as the use of the public buses and free Wi-Fi at the National Park’s hotspots. • city tax, to be paid directly to the hotel.